After the conference in December, I posted a public commitment to being more connected, whether it was blogging or tweeting or pursuing my own professional development. In fact, “walking the walk” is my theme for 2019. I had already made a private commitment earlier in 2018 when I signed on to participate in one of the first cohorts to complete the ISTE Certification. I am not a full time educator, but I teach School Technology, a graduate course, for University of Richmond each fall, and I have been experimenting with that course to make it more student centered and exploratory than a typical graduate course. Testing my syllabus against the ISTE Standards for Educators intrigued me. 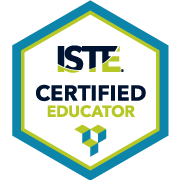 I am pleased to announce that I have successfully completed the certification process and am now an ISTE Certified Educator. As I had hoped, the process, especially the portfolio, allowed me thinkdeeply about my practice in all aspects of my work both in and out of the classroom. But, the work doesn’t end with the portfolio and the certification. My video reflection was called “Walking the Walk,” and I professed my commitment to connecting online and with my local community. I live in an underserved community and have been looking for ways to connect. The local 4H director introduced himself at the library Halloween party where I was demonstrating Makey Makey. Now, we are working together to sponsor a STEM special interest group. We start next Tuesday. We will be using some of the activities included in the coding curriculum developed by 4H and Google and also exploring Makey Makey and robots. I am excited but a little nervous as it has been awhile since I have worked with kids. The group will meet six times, and our first meeting is next Tuesday after school at the local community center. I spent the break doing lesson planning. We will be creating LED-lighted name tags as our first activity. I figured it was an engaging and quick way to assess their existing knowledge. We are also going to do an unplugged activity using cards to code a dance and share it. I will let you know how it goes…wish me luck! I have written before about my grandmother, Emma, who taught me to crochet. I was fascinated by the way the needle moved in and out even as she talked with me. She created beautiful pieces of utilitarian art like scarves and sweaters. But my main interest was in the intricate work of her tablecloths and doilies. The thread was thin, the needle was small and the patterns often grew out of a simple crocheted circle, gorgeous peacock and pineapple shapes appearing with each round. That was nearly 50 years ago, and I have been crocheting every since. Like my grandmother, I make stuff like scarves and hats, but my first love is thread crochet, using it for towel edgings, doilies and pillows. On the skill chart, I consider myself intermediate and probably able to tackle most projects. It has been some time, however, since I have challenged myself with my hobby. Crocheting is a way to relax, let my mind wander a bit, maybe watch a show or listen to a book while I work. And, there is nothing wrong with that. But, this year, one of my goals is to dive deeper into my lifelong hobby. There are a wide variety of different types of crochet including Irish, hairpin, Bruges lace, and tapestry. One pattern I have incorporates pearl beads into three dimensional ornaments, something that appeals to my inner engineer. In addition, there is the whole area of design and creating my own patterns. Hobbies like mine can spark that “lifelong learning” we talk about as educators. And, I know the school day is packed with stuff, but I think it is important to find time for these kinds of activities within the hours of school rather than as after school programs so we can reach as many kids as possible. Not every kid has a grandmother to teach them or the resources to access supplies. Crocheting is all about math with counting and patterns. Daina Taimina has been using crochet to create hyperbolic space, making more durable models than those usually done in paper. If you want to learn more about crocheting, the Wikipedia article is a great starting point. What hobbies do you have? Is there a challenge that you want to take to expand your skills and knowledge? It is warm enough here on the farm to have the doors open. I sat on the rocking chair on the porch and started reading my first book for the year: Of a Feather: A Brief History of American Birding. The first chapter pulled me in: an informal history that manages to celebrate not just birds but explorers and wilderness. I am, admittedly, a bird nerd so this may not be general interest, but it goes along with my desire to learn more about some of my hobbies. I chose this book as part of a challenge on LibraryThing, a reading community that I have belonged to since 2005. I have met a few of the folks in real life but most are virtual friends who share my love of reading and books. I want to spend more time here in 2019: again, an opportunity to focus on more deeply on reading, one of my lifelong hobbies. I was surprised and honored to be mentioned by Jennifer Orr who included one of my recent posts in her year end review. I did a bit more blogging at the end of 2018 and knowing at least one person read and thought about my post might be enough to keep me going into the new year. Plus, Jennifer’s reviews provide a great start to my reading list for 2019. I plan to be much more intentional with my online time in the coming year. Less mindless scrolling and more meaningful interaction. I am most excited about sponsoring a 4H special interest group related to coding in my local community. I live in one of the poorest counties in Virginia, underserved in many ways. But there are champions, and I have been able to connect with a few to sponsor the after school club in January. I spent my holiday break doing curriculum and lesson planning for our work together. I think my biggest challenge is finding a work/life balance, especially when there is a huge overlap between those two things. But I also love to play music and want to become more proficient on the guitar and ukelele, maybe even connect with a face to face group of musicians. And I want to make time to create in all kinds of ways: crocheting, paper cutting, electronics. One of my best moments from 2018 was participating in the local library’s Trunk or Treat event on Halloween and getting folks to interact with the screaming pumpkins and the joke telling hat, both powered by Makey Makey. I am a teacher of teachers, having spent time in both undergraduate and graduate classrooms at several Virginia universities. I teach online and face to face and recently wrote about my preference for face to face experiences. I have been able to keep up with some of my students through social media but, as with most teachers, it can be hard to keep track of many students as they head into the world. So, one of the pleasant surprises at the conference this year were the former students who came up to say hello and let me know the influence my class had on their work. And, I had the added pleasure of sitting next to a current student during Sarah Thomas’s digital equity session. He teaches in the underserved county where I live, and we have connected over this shared understanding of the real impact of the digital divide. He spoke eloquently about how the lack of connectivity impacts expectations about out-of-school learning and the importance of working towards equity for his students. I felt a little pang of joy that I was able to nurture this leader as he moved into the next steps of his career. Teaching is a “side gig” for me but it informs my other work in powerful ways as I think hard about the skills and dispositions my students will need to work and lead in the future. My School Technology class met last evening for the first night. I joined 14 practicing educators who have chosen to pursue advanced degrees and principal certifications at a university in Richmond. They come from surrounding divisions including urban, suburban and rural schools. One class member works at a correctional institution. My course is a bit free wheeling as I want to make sure students have time to explore and experiment with technology while considering its potential uses to support student learning. Last night, we spent time playing with Merge cubes. I had collected enough of them during the $1 frenzy earlier this year that I was able to give one to each student. All of them quickly followed the simple instructions to download the app and get up and running. But soon, one of them wondered aloud, “How is this educational?” Discussion ensued even as they continued to interact with the cubes. I’m sorry I didn’t grab some video! But one student went home and posted some after class as his second Twitter post ever! I teach online and enjoy the convenience but you can’t have the kind of experience we did last night where everyone explores in real time, sharing, helping, laughing. I am really looking forward to the rest of the semester!